When I was a new parent, my mother told me, "All young children want from adults is attention. They don't care if it's positive or negative so you might as well give them the attention you want to give them, because otherwise they'll take it from you and you're not going to like how they do that." 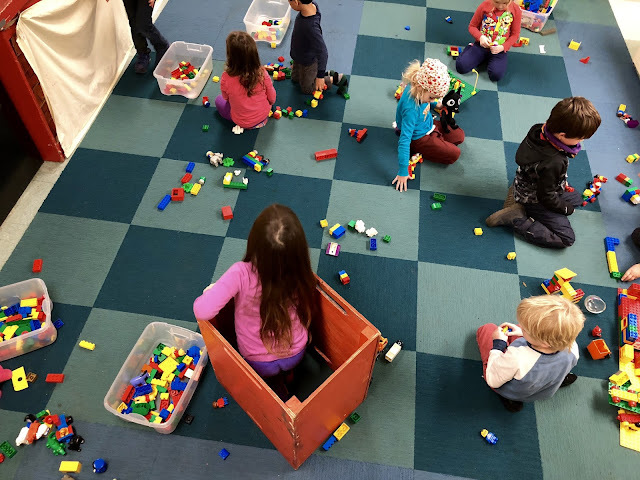 A few years ago, a boy named River was just milling around while most of his classmates were busy putting Duplos into their plastic tubs. On any given day, there are always one or two kids who opt out of the project of tidying up the classroom. With my mom's advice in mind, I tried to ignore him, focusing my attention instead on the children who were engaged. There was a time when I might have made the effort to try to coax or cajole him into participating, but I'd learned through experience that if that's where I put my attention, that's where the rest of the kids would want to be, so instead I tried to ignore him even as his non-involvement offended my adult sense of justice. 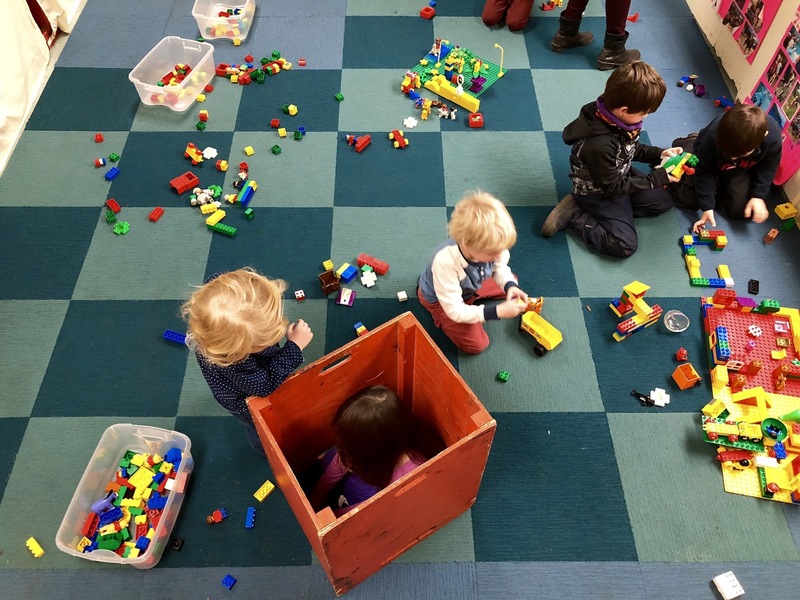 Whenever I write about how we handle clean-up time at Woodland Park like I did yesterday, readers write to ask what we do about those who decline to participate. The short answer is nothing. I tend to let them go about their business as long as they aren't impeding those of us who are taking care of the classroom. That's what I did in River's case, asking him to move when he got in someone's way, but otherwise staying relentlessly focused on the children putting those Duplos into the boxes. "Robert is putting away the Duplos super fast." "Missy is looking under the cabinets for Duplos." "Pat and Owen are are working together." "This is our school and we're taking care of it." Before long, the first of the plastic tubs was filled. That's when River sprang into action, leaping in from the sidelines to assertively snap a lid on the box, then snatching it away from the others to carrying it to its shelf. Again, my adult sense of justice was roused. That's not fair, I thought, The other kids did all the work and he stole their glory. None of the kids complained, but it irked me. Then, the following day, he did the same thing, so, in the interest of "protecting" the rights of the other kids, the ones who had done all the work, I decided I was going to try to prevent another repeat. 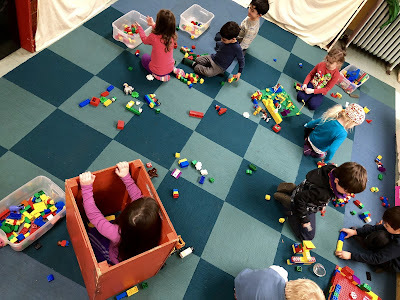 So on the following day when I saw him once more avoiding the "hard work," I engaged him quietly off to the side, hoping to give the other kids the opportunity to experience the satisfaction of snapping the lids onto the boxes they had diligently filled. As I whispered to him, we were interrupted by one of the other kids who insisted upon handing River the lid to the tub. I looked up to see the rest of the kids standing around it waiting for him to do the honors. You see, instead of being resentful of River, they had come to accept that it was his clear and proper job to snap the lids onto the full boxes. It was my adult sense of justice that caused me to think something was wrong, whereas the kids harbored no ill-feelings. Indeed, they saw him as essential. So yes, on any given day, there are two or three kids who don't pull their own weight, but it's not been a problem since I've learned to set aside my adult sense of justice and simply ignore them while focusing my attention on those who do. Perhaps the kids will one day develop this adult idea of justice, but I sort of hope not. In many ways, their concept of fairness is much more evolved than ours. I've just published a book! 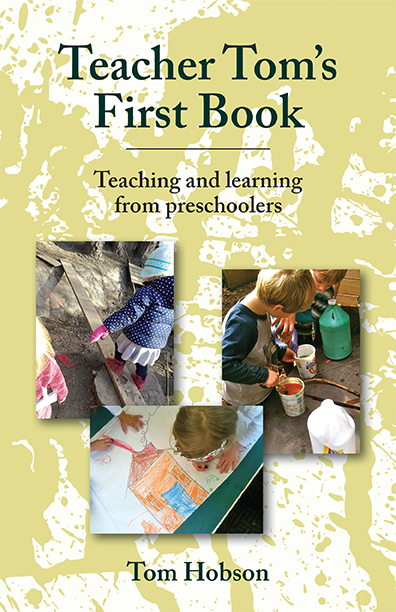 If you are interested in ordering Teacher Tom's First Book, click here. Thank you! I put a lot of time and effort into this blog. If you'd like to support me please consider a small contribution to the cause. Thank you!